Dublin Comic Con (Comic Con Ireland) and AsOne Productions (Celtic Throwdown) joined forces to create Games Expo Ireland which took place in the Royal Dublin Society (RDS) for a fun packed two days on November 25th and 26th. Cerebros was kindly chosen to demo at the event and had over 182 players test the latest vertical slice. Cerebros is the debut game of the company. Cerebros is a First-Person Shooter. Sprint, shoot and switch between two color states, light and dark, to attack/defend against a variety of sentient AI. At the Radisson Hotel in Galway City, Gamer Fest Ireland hosted a weekend of gaming and Cerebros was there to host a little corner of it and entertain 89 players over two days. Cerebros was at the PlayersXpo: throughout the weekend over 173 players played the latest vertical slice of Cerebros. Cerebros was on display at the Galway Games Gathering at GMIT in Galway. 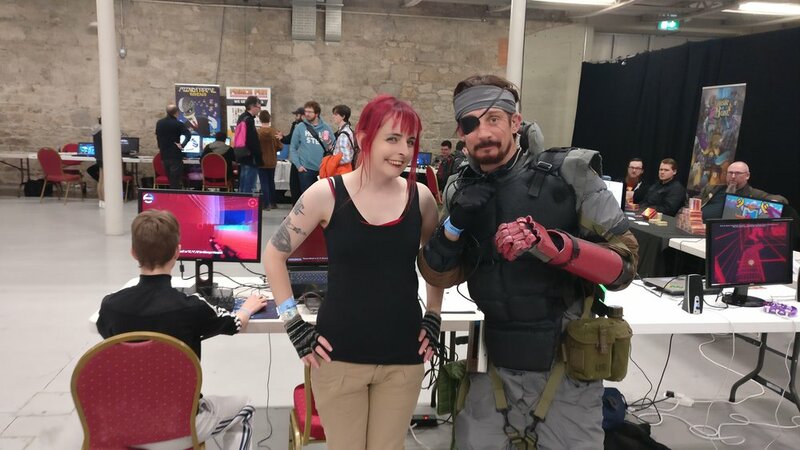 Unfortunately due to circumstances, Cerebros wasn't present on the Saturday, the busiest day of the event; however, while there wasn't a huge volume of players on the Sunday, the quality of feedback from people in the industry was invaluable. I didn't get a chance to see or hear any of the talks but from what I've heard from people that did, most of the talks were informative. The other games on display at the event were of high quality and are too many to name and shame. Cerebros was on the road again and also in the air: traveling all the way to Birmingham, UK to Multiplay's Insonmia 61. Suffice to say, this event dwarfed all the previous events in terms of volume of gamers passing through the hangar doors (the entire space rented out for the event felt like a huge hangar). 877 players tested and hopefully enjoyed Cerebros. There was a lot of positive feedback and some negative which was welcomed and embraced to feed back in to the game and improve it. I'm looking forward to going back there next year for Insomnia 62. Cerebros was on the road again to Dublin Comic Con this time. There was a massive Indie section on the second floor of the Dublin Convention Center in the Wicklow Hall. There was significant thoroughfare and the game received a lot of positive feedback from gamers and I received copious amounts of player data to help improve the game. Thanks to David Williams from Pulse College for hosting the Indie section and all the other Indie developers for a great selection of diverse games (list of all games below). Domino Daydreams - Daydream away knocking dominoes. As a First-Person perspective game, Cerebros lends itself to virtual reality [VR] easily. I was undecided on whether or not to expend resources, time and money, developing Cerebros as both a conventional and also a VR experience. I thought the visuals and mechanics, especially the bullet-hell traits, would add a lot of value to a VR experience and generate value for the game as a whole. Thanks to the kind support of Oculus in donating a Oculus Rift and Touch Controllers, I've decided to port it to the Oculus Rift and looking forward to all the challenges that will respresent. Thanks again Oculus! Nature's Zombie Apocalypse - a fun top-down local multiplayer wave shooter with inventive bosses. Space Toads Mayhem - a 2D shoot'em up with a great aesthetic and wicked power-ups. Beyond the Void - an RTS slash MOBA which had great art design and game aesthetic.